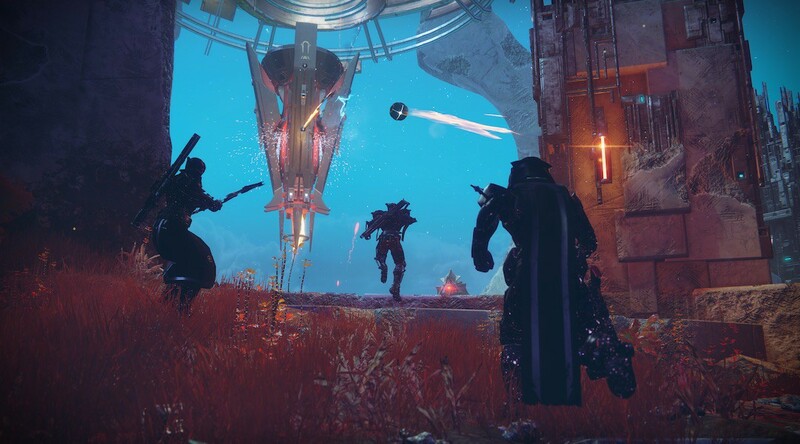 The developer Bungie has added a few other contents along with the introduction of Bergusia Forge in Destiny 2: Black Armory. The latest item offered by Ada-1 is the Forge Polimer, which extremely improve to gain the armor set. As we acknowledge, that the Black Armory armor was difficult to come by, along with the limited way to earn it. Well then, you might be happy with this latest item added in the game, and now, I will detail you for where to get and how to use the Forge Polymer in Destiny 2. Where to get Forge Polymer? Note that you’re only allowed to purchase and hold one Forge Polymer at a time. So once you’ve consumed your Forge Polymer, you’re free to return to ADA-1 and purchase another. 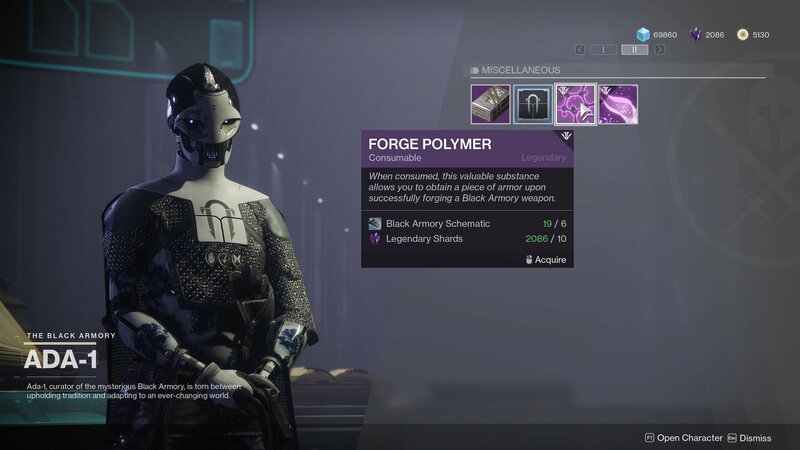 Means, Forge Polymer will grant you a free armor reward when you forge a Black Armory weapon from a compatible weapon frame. How to use the Forge Polymer? After purchasing the Forge Polymer from Ada-1, make sure that you have a weapon frame which is ready to be built through a forge ignition. Head to the necessary forge, then open your inventory and use the Forge Polymer just before starting. If you go to the Character tab of your menu, you will see a buff notified that Polymerized is active. As soon as you form a Black Armory weapon, the armor piece will drop for you at the same time, and you can start to form a Black Armory weapon in the forge. The good news is, when done correctly, you won’t only get a fully functional Black Armory weapon back, but also a random armor piece as well, plus, is no time limit on it. Means, the Forge Polymer will stay active even if you log out the game. 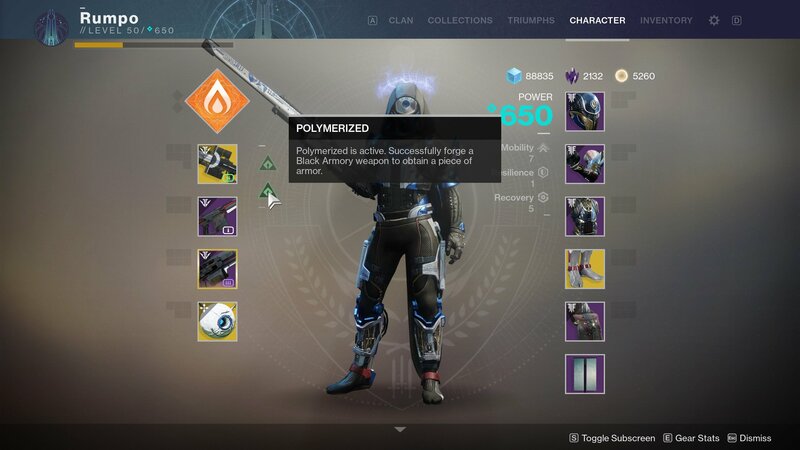 So, have you used Forge Polymer in Destiny 2? If you haven’t, then what are you waiting for? 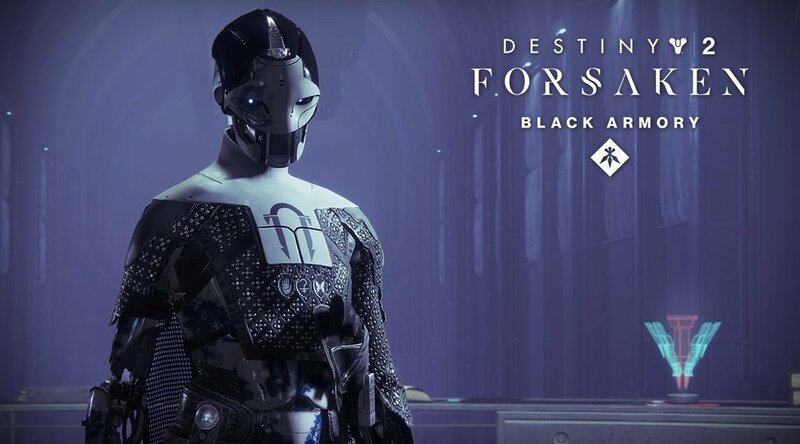 Destiny 2: Black Armory is currently available for PC, PS4, and Xbox One.